This is a very interesting chapter. For starters it’s optional, but this one has strong hooks that connect it to other areas in Barovia and other quests. Due to these interconnections it is probable that the party will wind up at the winery and try to help the Martikovs. This winery is the best in the multiverse because it is the only one that supplies it’s products free of cost to all towns in the Valley of Barovia and Castle Ravenloft. That’s right ! Free alcoholic drinks for all Barovians. And it is also implied that they ship it for free too. Even Strahd Von Zarovich has profited from this since his wine cellar features the Wizard of Wines products, plus wines imported by the Vistani. If your party has been following the clues all over the place then they are well aware that there is now a wine crisis since the winery is several weeks late in deliveries. By the time the party arrives to Vallaki, the problem is so bad that Urwin Martikov masters his pride and asks the adventurers to go there and investigate. I mention this because Urwin is the son of Davian Martikov, the current person in charge of the winery. Father and son have had a terrible relationship for ten years because Urwin allegedly lost one of the winery’s magic gems. Second to that, the situation is serious enough that when the party arrives to Krezk, Baron Dimitri Krezkov is willing to get out of their reclusive way and allow the party inside the town walls if they go and secure ONE wagon of wine. What happened to the wine? Well that is the million gold coins question. 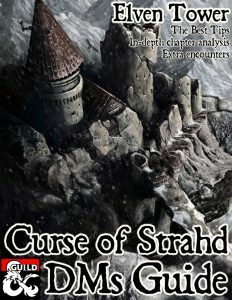 And once again, following the sour grey tone of Curse of Strahd, this is another sob story. As mentioned in page 173 in the chapter’s intro. 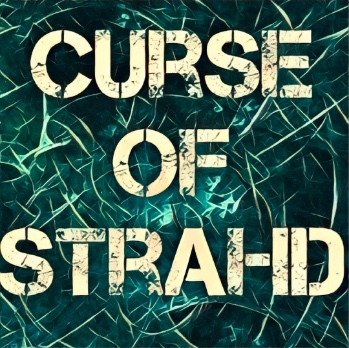 There were originally three magic gems helping the orchard resist the curse of Strahd’s land. Ten years ago, one gem was lost and since then, Urwin and Davian Martikov have hated each other’s guts. With the loss of that gem, the Champagne du le Stomp production stopped and now only the most wealthy or powerful still have access to whatever little is left. Count Strahd, Lady Wachter and Baron Vargas are good suggestions for people who still have a barrel or two of Champagne du le Stomp. There is no information in the book about the location or thief. My suggestion is that Strahd himself had it stolen and brought to Castle Ravenloft. After some modifications and experiments, he built the Heart of Sorrow with it. The second tragedy occurred three weeks before the adventurers visit the winery. Another gem was stolen by Baba Lysaga’s scarecrows. It is stated in the book that she had been fighting the wereravens for a time, trying to help Strahd by doing so. The scarecrows found the gem by accident and she stored it in her hut, which gave it a semblance of life. As if that was not bad enough, 5 days ago, the evil druids from Yester Hill stole the third gem and took it to Yester Hill. Davian and the other wereravens went there immediately with the intention of retrieving the gem. They failed miserably and were chased back to the winery. The druids had gathered a small army of blight creatures and assaulted the winery. Davian and his kin had no choice but to leave the place. They are now hiding in the nearby woods. The worst part is that the druids have begun poisoning the fermentation vats. The situation cannot be any worse. There only remains enough wine for one shipment and that’s the end of it (three barrels in W2 and another three barrels and several bottles of wine in W14). With no magic gems, the wine production is eventually going to stop altogether. This quest is closely tied to Yester Hill, and Berez, because two of the missing gems are in each of these places. Both destinations are also optional chapters. The strongest motivation to go either way is to help the Martikovs restore the winery to it’s previous status. The chapter is also tied to Krezk, Vallaki and the Town of Barovia. In these three places there is an NPC who requests a shipment of wine. Krezk has a meaningful reward for doing so, however (getting inside). If wine is delivered to the Blue Water Inn, Urwin Martikov will be willing to part with one of the magic relics, if he happens to be in possession of one. Once the adventurers decide to approach the winery to fight the druids and the blights, they find the place seemingly deserted. That’s just a ruse, the druids and some blights are inside the building poisoning the wine. And the rest of the blights are outside in perfect camouflage with the environment. When the party reaches the building, a group of 30 needle blights emerges from the vineyard. This is a crucial moment for this chapter because page 174 has a list of the number of enemies who are in the winery at the moment. It’s a total of 64 creatures. Total numbers: 3 druids, 35 needle blights, 24 twig blights and 2 vine blights. If the party enters the Martikov’s house then they can barricade themselves in any room and take the enemies slowly. In reality that’s the better option, the PCs will get the upper hand in the encounter and they will solve it more or less without much problem. But entering the house to barricade themselves kind of sounds like running, and most D&D parties do never run from a battle. That’s only the more fun for you, if they stay outside to fight, the party ends up fighting all the foes in the place at the same time. They arrive in waves however, as noted in page 175. None of these creatures or the druids are terribly powerful by themselves, but strength is in the numbers here. Needle blights are really dangerous in such big groups. They can easily surround a PC and attack. That’s 8 attacks against one PC. Assuming half of them are successful attacks. That would be 24 damage (8d8+4) average per round. Additionally, if the fight is short in space (like inside the house) and not all blights are able to attack, needle blights have ranged spikes attacks. The vine blights also have a melee attack with a reach of 10ft. This encounter is no joke if the party decides to handle it outside. That said, if the party has access to area-damage spells like Fireball, Burning Hands, Thunderwave or similar, then they can dispatch the blights in larger groups. Notice that only the twig blights are vulnerable to fire damage. The only two vine blights can cause havoc. They arrive in the last wave, but as soon as they do. They can use their Entangling Plants ability to restrain the party. This ability will not affect their brethren blights. Their Constrict ability has reach 10ft. and inflicts the restrained condition. Since this ability has reach, they can restrain a creature 10 ft. away and the victim will not be able to move any closer to attack. The druids are not particularly dangerous but they can sure do some damage to the party. They have Barkskin. Entangle is a great spell to restrain their targets while the needle blights attack from afar with their spikes. Finally, if the druid is surrounded, he can cast Thunderwave to get some space and possibly flee. One of the druids, the one in area W16, carries the Gulthias Staff. The druid can use the staff while attacking to recover some hit points with its Vampiric Strike ability. The staff also has the ability to destroy all blight creatures within 300 feet if it is broken or burned. This sounds all nice and all but it is unlikely to happen. To begin, the party will probably pick it up as loot, once the whole battle is finished, the ability not useful anymore. And then, even if they get it in time to be used, there is no way the PCs will know about that. And no PC will destroy a recently acquired magic staff in an adventure that’s so stingy about loot. However, you can always rule that a Religion or Arcana check, or attuning with the item will be enough to acquire that information. If the party gets the staff there is still another chance to use it. There are more blight creatures in Yester Hill, if they wish to help the Martikovs. The only problem with using the Gulthias staff like that in Yester Hill is that as written, it affects all blight creatures. So it should make the big tree blight die too. I don’t think that was the intention since the tree blight is a kind of boss fight. I suppose you can rule either way. Maybe it doesn’t work because this tree blight is the product of using the magic gem to give it life. After dealing with the blight infestation, Davian will be grateful and will explain the sad situation of the winery and how it will all be lost if they don’t retrieve the two gems from Yester Hill and the Ruins of Berez. If the party complies, then you have two extra quests in line, all good. If the party decides that this is not their problem and that they have helped more than enough, Davian Martikov bids them farewell. When and if the party returns at a later date, they find the place completely destroyed. The tree blight has trampled everything to the ground. The enormous tree can easily be tracked as it is making its way back south to Yester Hill. There will also be scarecrows from Berez taking guard in the winery’s ruins. This is the worst that can happen. The wine production is over. Even if the gems are recovered, it will take years of labor to rebuild the winery and start producing more wine. Since the main battle includes up to 64 creatures. This is a great opportunity to try and playtest the Mass Combat rules released by WotC in the Unearthed Arcana updates. I have not tried them myself, so take this advice with a grain of salt. They are designed to make the handling of large scale battle easier so maybe it’s worth the shot. The play-testing free PDF can be found here. Extra thing. 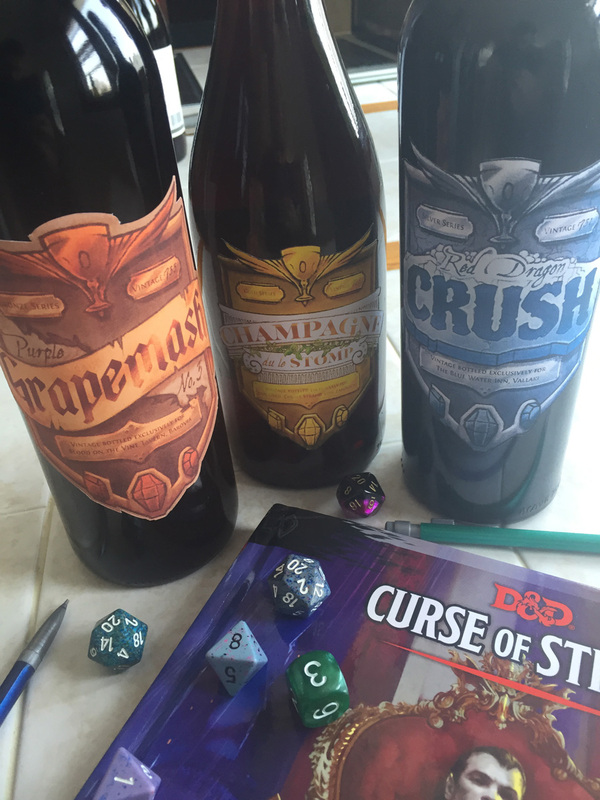 There are community content illustrations for the Wizard of Wines different product labels. I think it’d a great prop for the table, to have a bottle of wine or any other drink labeled with a barovian label. The labels are a Pay What You Want article at DM’s Guild. They can be found here.